Author contributions: Eriksson EM performed the research and wrote the paper; Andrén KI performed the research, wrote some parts and revised the paper; Kurlberg GK wrote some parts and revised the paper; Eriksson HT wrote some parts, revised the paper and made a substantial contribution to the economic portion of the IBS research. Irritable bowel syndrome (IBS) is one of the most commonly diagnosed gastrointestinal conditions. It represents a significant healthcare burden and remains a clinical challenge. Over the years IBS has been described from a variety of different perspectives; from a strict illness of the gastrointestinal tract (medical model) to a more complex multi-symptomatic disorder of the brain-gut axis (biopsychosocial/psychosomatic model). In this article we present aspects of the pathophysiology and the non-pharmacological treatment of IBS based on current knowledge. Effects of conditioned stress and/or traumatic influences on the emotional system (top-down) as well as effects on the intestine through stressors, infection, inflammation, food and dysbiosis (bottom-up) can affect brain-gut communication and result in dysregulation of the autonomic nervous system (ANS), playing an important role in the pathophysiology of IBS. Conditioned stress together with dysregulation of the autonomic nervous system and the emotional system may involve reactions in which the distress inside the body is not recognized due to low body awareness. This may explain why patients have difficulty identifying their symptoms despite dysfunction in muscle tension, movement patterns, and posture and biochemical functions in addition to gastrointestinal symptoms. IBS shares many features with other idiopathic conditions, such as fibromyalgia, chronic fatigue syndrome and somatoform disorders. The key to effective treatment is a thorough examination, including a gastroenterological examination to exclude other diseases along with an assessment of body awareness by a body-mind therapist. The literature suggests that early interdisciplinary diagnostic co-operation between gastroenterologists and body-mind therapists is necessary. Re-establishing balance in the ANS is an important component of IBS treatment. This article discusses the current knowledge of body-mind treatment, addressing the topic from a practical point of view. Core tip: Due to the complex nature of irritable bowel syndrome (IBS), no long-lasting generally accepted therapies are available. Different lines of research have been developed to address this issue. One line focuses on identifying intestinal mechanisms that may be affected by pharmacologic intervention. The understanding of IBS, especially the interactions between the central and enteric nervous systems, has grown considerably in recent years. Because recent research has focused more on the body-mind aspect of the disease, body-mind remedies such as hypnotherapy, psychotherapy and body awareness therapy have been applied. In highlighting this topic we discuss non-pharmacological methods and practical guidelines for the treatment of IBS. Irritable bowel syndrome (IBS) is one of the most commonly diagnosed gastrointestinal conditions, characterized by symptoms such as abdominal pain, cramping or abdominal bloating, faecal urgency, and alteration of bowel habits with the relief of pain or discomfort upon defecation. Women are more frequently diagnosed with IBS than men. IBS patients are generally subdivided into diarrhoea predominant (D-IBS), constipation predominant (C-IBS) or an alternating type (A-IBS), which stool fluctuates between diarrhoea and constipation[1-5]. IBS generates a significant healthcare burden with huge economic costs[6-9]. Increased economic consequences are also incurred as a result of unnecessary surgery. A threefold higher rate of cholecystectomy, a twofold higher rate of appendectomy and hysterectomy and an approximately 50% higher rate of back surgery have been recorded in IBS patients compared to those without IBS[4,10]. The severity of symptoms varies widely, from very mild to incapacitating. The prevalence of moderate and severe cases may be underestimated. Previous studies have highlighted how IBS impairs health-related quality of life, possibly even increasing the risk for suicidal behaviours[12,13]. An IBS diagnosis is based on clinical symptoms and the exclusion of somatic diseases[14,15]. Clinical symptoms have often been defined through questionnaires including the Manning, Kruis Score, Rome Criteria, Abdominal Symptom Questionnaire and the Gastro Intestinal Scale[15-19]. These questionnaires differ in how the questions are formulated. To be classified as IBS according to Rome II, patients answer, “yes or no” to the question; “in the last 3 mo, did you often have discomfort or pain in your abdomen?” If they answer “no” they do not have IBS. While in the Gastro Intestinal Scale, the questions consist of a seven-point scale from no discomfort to the worst conceivable symptoms. In the Rome III questionnaire more alternatives in most of the questions are provided. In our experience, individuals rate their pain in different ways depending on their earlier life experiences, body awareness, gender, etc. In addition to gastrointestinal symptoms, IBS patients often experience a wide range of other problems, such as non-abdominal pain, psychological symptoms, low quality of life, as well as difficulties in carrying out activities of daily life[13,20,21]. They also exhibit complicated body tensions, bodily stress patterns, low body awareness and abnormal stress parameters[18,22-27]. Many IBS patients have been exposed to traumatic events and may also have low self-esteem, difficulties setting limits and hypersensitivity[28,29]. Therefore IBS patients may show many signs of being in a state of chronic distress. In 1948, Collins defined the syndrome of irritable colon as a hyperirritable, neuromuscular imbalance of the colon sufficiently severe to cause abdominal pain or distress. He stated his long-time interest in the dysfunction of the gastrointestinal tract due to functional as well as somatic causes: “The purpose of this communication is to emphasize physiologic, local irritative and psychosomatic factors”. In 1956, Bargen wrote, “The so called irritable colon is primarily the result of an emotional disturbance, a tension state, abuse of laxative agents or a dietary indiscretion” and concluded in his article that “actually, there are no medicines that are substituted for a carefully planned program of management of the digestive problems of these persons. Measures should include particular attention to their emotional disturbances, their situation in respect to stress, and particularly their dietary problems”. During the sixties, IBS was defined as a disease of the gastrointestinal region and treatment was largely pharmacological. In 1999, Wessely et al wrote an article entitled ”Functional somatic syndromes: one or many?”, after which several physicians expressed their frustration about the management of IBS. Enck et al wrote in 2008, “the next consensus for the irritable bowel syndrome has to be interdisciplinary”. In the late seventies the term “biopsychosocial” was introduced; since then, over 90 articles have been published according to PubMed using this term in reference to IBS. 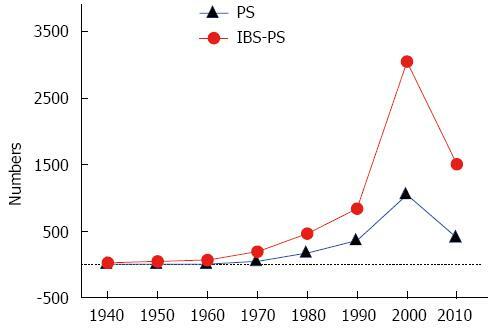 Throughout the years, IBS articles have been published in both psychosomatic journals as well as in medical-gastroenterological journals (Figure 1). The search terms used were IBS/irritable bowel*/psychosomatic*(PS) and IBS/irritable bowel*- psychosomatic* (IBS-PS), published from 1940-1949 through 2010-2012. The number of articles from medical-gastroenterological journals outnumbers those from psychosomatic journals. Throughout the literature, two views emerge; one is the medical view of IBS as a strict disease of the gastrointestinal tract, while the other is the psychosomatic/biopsychosocial view in which IBS is seen as a more complex multi-symptomatic disorder. Ålander and others suggest that IBS causes an increased demand on healthcare due to increased overall co-morbidity, thus requiring a more holistic approach to understand the underlying mechanisms and develop effective treatments[21,29,34]. Figure 1 Number of references in psychosomatic journals and in medical-gastroenterological journals from 1940 to 2012, presented in decades. PS: Psychosomatic journals; IBS-PS: Medical-gastroenterological journals. Substantial evidence exists that IBS shares many features with other syndromes such as fibromyalgia, chronic fatigue syndrome, somatoform disorders, and unexplained urological conditions[35,36]. The diagnosis given to a patient with one of these conditions often depends on the hallmark symptom and the expertise of the treating clinician rather than on the condition itself[32,35]. The syndromes above have also been called functional somatic syndromes, medically unexplained symptoms, somatoform disorders or unexplained clinical conditions. These syndromes are often characterized by a lack of a clear physical or biological aetiology or an inconsistent demonstration of laboratory abnormalities[32,35,36]. It has been suggested that these conditions should be gathered under one common name, such as bodily distress syndrome, central sensitivity syndrome, or dysfunctional syndrome[36,37]. These patients are likely to consult primary health care as well as different specialty departments at the hospital. Within the past decade there has been increasing evidence supporting the concept of IBS as a multi-symptomatic disorder of brain-gut function[35,38,39]. The brain and the enteric nervous system communicate through the autonomic nervous system (ANS) and the hypothalamic-pituitary-gut axis. This communication allows stressors in the brain to influence gut function (top-down) and stressors in the gut to influence the brain (bottom-up). This bidirectional signalling can result in the dysregulation of the autonomic nervous system, which may play an important role in the pathophysiology of IBS[41,42]. An altered stress response may be involved in the disruption and impairment of the brain and gut axis. Research convincingly shows that unregulated stress early in life is a serious risk factor for developing various adult syndromes[36,43]; almost 80% of exposed young adults do not meet the criteria for successful psychosocial functioning in adulthood. Such stress conditions occur when children are exposed to severe situations such as physical, psychological, or sexual abuse or family violence. The consequences of an unmanageable event, such as a threat, are especially serious in a person with an early vulnerability or with a cumulative impact of negative life events. Such persons can have an abnormal sensitivity to any stimulus[45,46]. The support system in the hippocampus is constantly prepared for new traumatic experiences, as a sort of built-in “smoke detector”. All of this can result in a long-term arousal of the nervous system, a hypersensitivity to stress and various psychosomatic/pathologic conditions in adolescence and adulthood. Additional factors of the pathophysiology of IBS may include significant stressful life events as an adult or a stress reaction (fight or flight) that is repeated over time, become conditioned, and will start automatically in stressful situations[47,48], so-called conditioned stress. Thus, an early vulnerability together with uncomfortable experiences can result in complex conditions in which emotional dysregulation, relationship problems, somatic stress and dissociation are encountered. When neither fight nor flight reactions (the first more natural survival behaviours after a threat or stressor) are possible, the so-called freeze reflex (dissociation) may occur. Dissociation is the most severe condition related to dysregulation of the ANS. It is important to understand the somatic manifestations of the stress response dissociation, as there is a close connection between psychological and somatic dissociation (when a patient cannot understand the messages from his or her body)[51,52]. Such emotional dysregulation may remain associated with certain regions of the body and never reach the conscious mind. Some IBS patients request repeated somatic investigations and minimize the role of psychosocial factors. This can be explained by their unconscious and somatic distress. Somatic dissociation results in decreased self-trust over time. This is a serious handicap in, which a patient’s resources are completely exhausted; this can lead to burn-out syndrome without the patient’s awareness[47,48]. Various emotions play key roles in altering autonomic and endocrine function, which in turn may derange the emotional circuitry. The invalidation of emotional experiences as well as difficulty expressing and recognizing emotions (alexithymia) are often observed in IBS patients. Gut function and pain sensation are centrally regulated by the emotions and the degree of awareness of the body’s symptoms. Thus the degree of the patient’s body awareness is crucial. Long-term stress with distress, altered muscle tensions and repression of impulses can affect the ability to pay attention to the body and thus act on a person’s body awareness. Impaired body awareness has proven to be one cause of stress-related ill-health[54,55]. Gastrointestinal microbial composition can be altered by infections, inflammations, diet or abdominal surgery[9,41]. All of these can affect different systems in the intestine. Several pathophysiological mechanisms, including visceral hypersensitivity, GI motility dysfunction, intestinal inflammation, altered bowel microbial flora, and imbalance in the secretion of 5-hydroxytryptamine (5HT) have previously been reported. ANS dysregulation may, as mentioned above, occur by at least two different ways with alterations in many physiological reactions. A very complex interaction between factors may exist, and therefore trigger(s) of IBS syndrome can vary between patients. An imbalance in the ANS is seen in IBS but also in fibromyalgia, chronic fatigue syndrome and in interstitial cystitis. This raises the possibility that ANS dysfunction and/or chronic stress may be the common underlying pathogenesis[56-59]. Chronic on-going life stress can predict the development of IBS[36,58], and patients may experience symptoms up to 5-13 years prior to diagnosis. Consequently, re-establishing balance in the ANS should be one important approach in the treatment of IBS. Many authors emphasize the importance of a thorough examination of IBS patients with their many symptoms after excluding important somatic diseases[18,22,29,47,48,61]. In our studies, IBS patients are assessed via two physical examinations (one standing still and one during movement), blood and saliva samples after completing a thorough medical history. The patients complete questionnaires regarding gastrointestinal symptoms, psychological and psychosocial symptoms, and pain, dissociation, and quality of life and body symptoms[18,22,23]. In our study we found that gastrointestinal symptoms, body-oriented examinations and the patient’s pain-drawings showed mostly deviating patterns, whereas the psychological and biochemical data were deviated or within normal limits during assessment before treatment. In our experience to date, none of our more than 300 patients expressed only gastrointestinal symptoms. IBS is a complex syndrome and most research concludes that the management of IBS should rely on a combination of non-pharmacological and pharmacological therapies as well as dietary and lifestyle modifications. Some authors claim that treatments involving interactions between body and mind are the most effective and thus the most powerful treatment strategies in IBS/body distress patients[37,62,63]. Various non-pharmacological treatment regimens have been used for IBS, including relaxation training, behavioural and psychological therapies, stress management, and meditation. Furthermore, body-mind therapies such as gut-directed hypnotherapy, mindfulness therapy, body awareness therapy and functional relaxation have been used with promising results both during treatment and at follow-up[18,22,29,64-83]. Table 1 summarizes various methods that have been used from the early 1980s until now. Over the years, these treatments have progressed from mostly individual to mainly group sessions; currently, there is a trend toward prolonged treatment sessions. The treatment modalities have also gone from focusing either on the body or the mind to now focusing on both. Cognitive therapies currently include body relaxation methods together with appropriate theories. Gut hypnotherapy adds body relaxation to mental exercises (guided imagination). Both therapies have reported responders and non-responders[81,82]. Mindfulness therapy and body awareness therapy consist of body movements inspired by Eastern philosophies, with the purpose of helping the patient to be present within the moment[83,84]. Physical activity, performed as supervised graded exercise training, has also had a positive effect on some patients with body distress syndromes such as fibromyalgia. The ANS is reported to be influenced by breathing exercises and also by the use of movements such as Qigong, Tai Chi and yoga[48,60]. Table 1 Overview of different non-pharmacological treatments for IBS patients. PMR: Progressive muscle relaxation; IBS: Irritable bowel syndrome. Gut directed hypnotherapy: Relies on inducing a state of relaxation or trance (altered attention in the subject) in response to verbal or other stimuli, with suggestions for improvement made based on whatever condition is being treated. The patient is taught relaxation, ego strengthening and coping skills. Tailoring the therapy to the patient’s symptomatology is very important. The importance of practice cannot be over-emphasized and should ideally take place on a daily basis. It is often necessary to provide 12 sessions of treatment to gain maximum benefit. According to the author, this is a technique that is exceptionally operator-dependent. The key aspects of mindfulness are to observe without reacting to internal sensations and to pay emotionally neutral attention to all experiences, impressions, thoughts and feelings. It is also important to be fully present in all activities and have a non-judgmental approach to life experiences. Adaption of this practice to an IBS population was done by emphasizing the relevance of mindfulness in coping with IBS-related symptoms and perceptions. Participants are instructed to notice any sensations in the abdominal area and to distinguish those sensations from thoughts about the sensations. Instruction and homework assignments are related to body scan, sitting and walking meditation, and mindful yoga. Body awareness therapy: Body awareness therapy (BAT™) consists of simple structured movement exercises based on human anatomical and physiological prerequisites to achieve optimal movement dynamics[54,55,84]. The BAT™ exercises aim to help the body find its natural posture, thus facilitating the circulatory, muscular, nervous and breathing systems to recover their natural function. By doing so, unconscious physical and psychological experiences will be brought into awareness and can be dealt with both physically, mentally and verbally. BAT™ was developed by Swedish physiotherapists in the early seventies, and it is now used for treatment of various pain and stress-related conditions in all Nordic countries, as well as in Scotland, Switzerland, Austria, the Netherlands, Spain and Turkey. The assumed mechanism of functional relaxation is the treatment of somatoform autonomic dysfunction with proprioception. Very subtle movements of small joints are performed during relaxed expiration, which is accompanied by focusing on and exploring the perceived differences in body sensations triggered by these movements. This takes unconscious physical/psychological experiences into account and, as basic motivational systems are rediscovered and further developed, early forms of bodily self-awareness can be re-experienced. One common goal of these four methods is to learn how to be aware in the present, to be in the here and now. The posture, breathing, and level of muscular tension together with the function and mobility of the inner organs are affected by body-mind training. Bodily experiences always exist within the present, awareness of emotions is inseparable from the consciousness of their bodily expressions and together, all of these express how a person feels physically and mentally. In this way, body-mind therapies are assumed to work through a physiological transformation accomplished via the autonomic nervous system[53,84]. Although the methods differ slightly in how they are addressed, either through the mind (hypnotherapy and mindfulness) or through the body (body awareness therapy and functional relaxation), the treatment results are similar. Hypnotherapy has been used in IBS patients with good results since Whorwell et al introduced it in 1984. Hypnotherapy has been used mostly with gut-directed therapy and mostly on an individual basis; patients are given an audio-tape for homework. However, according to Whorwell et al, 2006, it is a labour-intensive modality with a finite success rate and is not suitable for everyone. He suggests that it is best incorporated into a program of graduated care that has a contingency plan for dealing with individuals who do not respond to this particular form of treatment. Improvement in symptoms with hypnotherapy is largely sustained, although some patients may require occasional “top-up” sessions to maintain their improvement. Carolusson and her team also used individually tailored techniques but included both gut-oriented hypnotherapy and hypnoanalysis either separately or in combination. The author conclude that the hypnosis treatment has to be designed depending on the patients’ personality and possible mental defence-functions in relation to the symptoms as well as the patients’ mental and social resources. When treating patients with body awareness therapy in a group, one has to emphasize that each person concentrate on and listen to her own body and not to carry out any movement that does not apply to her. In allowing the body, and not the mind, to do what it wants, one can find a way out of pain[54,55]. The ability to listen to the body might be severely impaired in patients at the beginning of treatment. By suggesting that patients try different ways of performing an exercise, the therapist(s) can help the patients find what is comfortable for them[18,22,55]. A good working alliance and safety in the treatment situation are important for change to take place[47,48,61,86]. When treating IBS patients with a tendency to dissociate, the therapist must be careful not to re-victimise the patient and thus risk the patient dropping out. By noticing early warning signs for dissociation and with careful guidance, the patients will learn how to build a trusting relationship with themselves and others, to maintain a psychological as well as a physical integrity (maintaining boundaries) and to gradually find words to describe the body’s signals and sensations. Thus, with increasing body awareness, the patients learn how to stabilize themselves when emotional systems are aroused[47,48,61]. To first perceive the body and then to connect the sensations in the body with a certain sense or emotion is crucial for the treatment to be effective[22,61,84,87]. The patient may express after several treatments: “Before I just had a stomach ache, but now it is like that just before I get pain, I feel angry”. The length of treatment can be crucial[18,22,29,61]. A short treatment duration is not always sufficient for all patients; some can be left behind as they display more symptoms[18,22,29,61]. In our studies, we have found that there can be different patient treatment processes. IBS patients grade themselves on different symptom questionnaires, and body and biochemical parameters are assessed; the process can be determined by these parameters. For example, one patient estimated high levels of symptoms before treatment that were reduced after treatment. Another patient who started out by estimating low levels before treatment scored higher at 12 wk and then lower again at 24 wk. This patient probably needed more time to become aware of bodily sensations, and thus “underestimated” the levels before the treatment start. A third patient may score increasing symptoms during the entire treatment period. This is an example of a patient who started out with a very low body awareness, whose experiences have been out of reach in the body and slowly emerged to awareness during treatment. Hence, treatment of this patient should not be concluded until the symptoms decrease[22,29]. In another study, some patients’ symptoms worsened after 12 wk with 1-h treatments each week. Some authors suggest that a treatment period of 12 wk was not long enough to achieve deep, long lasting improvements[29,37]. Treatment can potentially uncover denied or dissociated suffering, leading to a period that can be painful, sad, and heavy for the patient. In our studies (24 wk with 2 h weekly) we have found that these periods mostly occur between 8 and 12 wk of treatment for most of the patients[18,22,61]. In hypnotherapy, Gonsalkorale et al showed that males with D-IBS showed lower results with hypnotherapy at 12 wk of treatment than did females. We found that 12 wk of treatment with body awareness therapy was not enough for D-IBS patients, who needed 24 wk, and that these patients showed lower body awareness at their first assessment[18,22]. Our theory was that they needed 12 wk to increase their body awareness and then the rest of the treatment time to restore it[18,22]. One study noted that although the treatment reduced distress such as anxiety and depression, it did not affect gastrointestinal symptoms. In our experience, reduction of the distress occurs prior to the reduction of gastrointestinal symptoms. A number of authors emphasize the importance of a good working treatment relationship between the patient and the clinician/therapist[38,70,74,88,89]. The therapists need to learn how to create practicable channels of contact. A person with a cognitive orientation wants to obtain a theoretically plausible explanation of her problems in order to feel secure. A person with alexithymia traits, who does not have words for emotions and cannot express them, needs to be confident with her body and increase her body awareness. A person with a vivid and colourful imagination is probably susceptible to exercises that include mental visualization. An optimal treatment plan should comprise all of these components[47,48]. A treatment structure with body awareness movements integrated with theory and reflections may be one appropriate treatment design[18,22,61]. For example, to a traumatized person, a description of trauma and its effects on the body can provide an explanation for the inexplicable symptoms she experiences. A patient may say, “When I come home to mom’s street, I felt that something bad had happened here, but I do not know what it is”. Another patient may allow herself to remember the terrible things that happened during her early years and finally put it into words. Histories of abuse are not always volunteered by patients. Many studies have shown that the patients’ gastrointestinal symptoms and the extra-intestinal manifestations improve along with increased body awareness. This is in sharp contrast to pharmacological approaches, in which often relatively few symptoms resolve. Patients develop better relationships with their own body and with life around them. As exemplified by one patient; ”I can now notice how I am sitting, standing and walking, if I am anxious or relaxed and also that feelings quickly transmit to the stomach”. The patients change from feeling controlled by their gut and their symptoms to feeling safer and able to handle different situations in life, both physically and mentally. They may say, “I now recognize when the stress in the body speeds up and can stop in time”. Patients with gastroenterological problems can affect their symptoms with suitable exercises: “I have great use of the exercises that I learned at our meetings; I practice them daily and have now only minor phases of pain from my diverticulitis”. In our studies, the leaders noted recurring indications during treatment that patients became more relaxed and more grounded. We observed, for example, decreased facial tension and better balance in movement. The patients developed a better relationship with their own bodies, which, among other things, was noticeable when they found it easier to relate to their own body and expressed more positive opinions about it. The patients also scored lower levels of psychological symptoms such as depression, obsession, anxiety, anger and phobias after treatment. As the patients became more aware of their symptoms, they could improve their body awareness and their symptoms decreased. In the group situation, the changes were also reflected. For example, patients who were silent earlier became more confident and started talking more in the group, and those who had not previously taken part in pair exercises now participated. They also showed more assertiveness and self-esteem, expressed as: “I have noticed, that I am more clear with how I would like to have it, I stand up for myself, and I get a greater response”. Some patients reported that they had stopped dwelling on injustices from the past and could release these and move on. Many authors, including Collins et al in 1948, Bargen et al in 1956 and Enck et al in 2008, stressed that IBS is a complicated condition with both physiologic and psychological factors involved in the pathogenesis. According to Gonsalkorale et al in 2002, IBS has gained the reputation of being somewhat unrewarding to treat. As a consequence, physicians are inclined to adopt the approach of ensuring that there is nothing “seriously wrong” by a process of thorough investigation but not necessarily offering help in terms of how to cope with the condition. Many of the patients, especially the severe cases, have lost their confidence and feel like “failures” with no hope when they come to an assessment[61,72]. Because IBS patients also exhibit a variety of symptoms, they find it difficult to “fit in” within the normal health care system with its high degree of specialization. For example, within the field of gastroenterology, hospitals may have different departments for the upper and lower gastrointestinal tract. This involves a great risk that patients with multiple symptoms and multiple diagnoses may fall in between categories, and that their treatment will be inadequate. However, by adopting a graduated treatment program with a team approach to management, extremely high levels of satisfaction in patients and fulfilment in staff can be achieved. The key to effective treatment strategies for these multi-symptomatic IBS patients is to understand the heterogeneity of the disorder. A pathophysiological explanation may be that ANS dysregulation occurs due to conditioned chronic stress or emotional stress (traumas) experienced early in life or later on. The emergence of ANS dysregulation may also be caused by a straightforward effect on the gut. Thus, a question may arise as to whether we can give these different types of IBS patients the same non-pharmacological treatment, or if we should differentiate the treatment for different types of IBS. One study has shown that approximately 25 percent of patients repressed somatised psychological problems and needed insight oriented hypnotherapy in addition to gut-directed treatment. Similar proportions have been reported by others[88,89]. A comprehensive body examination can give us a hint about the non-pharmacological treatment duration needed for a patient to improve. When IBS patients are either treated too briefly or with a treatment that is not optimal, the patient may experience relief from some symptoms, but the underlying distress present in quite a few of these patients will remain untreated and can be replaced by other symptoms (known as symptom shift). The risk is that their underlying problems will be expressed in new ways, and that the patients will therefore seek treatment elsewhere without ever understanding their internal body-mind communication. It is the opinion of many authors that treatment should be carefully chosen after a thorough examination of each patient and that treatment should target all of the symptoms[21,72,85]. Those patients who need longer treatment durations may be patients defined as non-responders, males with D-IBS or those who have severe social stress; these factors are likely to detract from the efficacy of the treatment. One suggestion for the lack of improvement in males with diarrhoea was that they had somewhat lower hypnotic or imaginative abilities compared to females. Another possible cause for the lack of improvement could be that these males with D-IBS had lower body awareness from the beginning. We know that D-IBS patients with lower body awareness have prolonged recovery times[18,22]. However, the results in that study did not separate men and women because of the low number of men enrolled. Some patients will experience relief from some symptoms but not always the gastrointestinal symptoms first. Hypnotherapy, body awareness therapy and mindfulness treatment will almost certainly improve their coping skills in life situations. It is unclear whether these body-mind therapies such as hypnotherapy (guided imagery), mindfulness and body awareness therapy have something in common or are separate entities. These methods involve the body by relaxing the muscles or by normalizing muscle tension, and they also emphasize the importance of being present in the moment. Only in the present one can access and influence the experience and behaviour patterns of the body/mind, which are established in the nervous system. A plausible consequence of this is that consciousness of the “here and now” is essential for changing processes and should be the focus of therapy from the beginning. The patients must first become aware of the present moment and the elements of their experiences of both the body and the emotional sphere in its entirety. Then, they understand that they need to learn to react differently to alarming situations that otherwise can be made worse by their response to it. This educational process is one part of the therapeutic package together with body awareness. The technique can thus be used to control symptoms and to reduce psychological distress and improve coping skills[61,90]. There is a general consensus that the health problems that will dominate in the future are psychosomatic or psychosocial disorders or diseases. It has also been suggested that in the public medical service one cannot make use of the same diagnosis and treatment that is used for welfare diseases. This should cause us great concern, and we need a new approach for these patients. Good teamwork is important during this new approach to treat multi-symptom patients. Therapists should be encouraged to discuss IBS cases with each other and also with the physicians included in the team to ensure that any real or potential medical problem that may arise can be promptly resolved[61,85]. The pathophysiology of IBS syndrome likely depends on autonomic dysfunctions that can affect the patient both “top-down” (from the brain to the gut) and “bottom-up” (from the gut to the brain), leading to multiple symptoms such as increased intestinal sensitivity and motility dysfunction. In addition, psychological distress enhances these symptoms. The key to planning effective management strategies is to understand the heterogeneity of this disorder. Thus, treatment should be focused on a body-mind intervention directed by a good assessment survey of the individual patient both by a gastroenterologist and a body-mind therapist. The duration of the treatment should be adjusted according the needs of the individual patient.